← Yes, God Does Bring Angels, Aunt Columbia! About a month and a half ago, I checked my email inbox, and found this wonderful vintage photo. It made my day! Grazie mille, Paolo! The man standing near the doorway is Antonino Carroccio. He is the paternal grandfather of Paul Carroccio, who was kind enough to share this fabulous vintage photo, circa 1928. The man sitting in the truck, was Morris Croot, a farmer from Holland Township, New Jersey. Antonino was part owner of a family-run cheese shop, “Latticini” located at 311 East 107th St., N.Y.C. 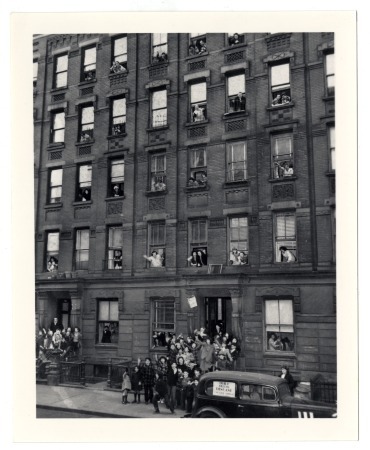 His father, Alfio Carroccio, came to America in 1890, and settled in a tenement building at 311 E. 107th Street. Subsequently, Alfio opened this latticini/cheese shop, selling mozzarella, ricotta, eggs, butter, milk, etc. After establishing this business in East Harlem’s Italian quarter, Alfio returned to Sicily around 1904, and left the business to his sons, Antonino, and Alfio, Jr.
Paul mentioned in his email to me, that the cheese was originally made locally in East Harlem, but the milk they bought to make the cheese, came from New Jersey. However, the family continued to do that until 1908, when they decided to rent a location in New Jersey (to make the cheese) nearby to where they bought the milk, for freshness sake. So began the shipping of cheese (in ice) to East Harlem! The cheese from the Carroccio’s Latticini shop was sold to local residents, Rao’s restaurant, on Pleasant Avenue, and many other establishments. Hey, come to think of it, I bet that my grandparents, and great-grandparents bought cheese and other items from this cheese shop! If only I could ask them! AIEH…thanks for the memories! Nice story, do you recall Ammirato’s Hardware on E. 116 ? No, I do not recall the hardware store. My family moved out of the old neighborhood when I was about 5. My older siblings probably remember it, though. Thanks for your comment!